I've seen LOTS of singing time planners and schedulers out there. I'm more of a simpleton when it comes to my scheduling (if you aren't familiar with my monthly singing time schedules, you can check them all out HERE). I only like to plan a month ahead (with the exception of my outline summary (found HERE) and my annual CD found HERE) using a simple Word document. But I get several requests from those who like to plan out the whole year asking if I have something - well, now I do! I think my favorite planner out there (and from what I can tell, I'm not alone!) is the one from Primary Singing Time Ideas found HERE. It's basic and simple yet very organized and effecient - just the way I like things ;). Unfortunately, Brittney (the blog author) isn't currently updating her blog - at least what I can see. So I've taken the liberty to create a 2018 Singing Time Planner and Scheduler using her template as a guide. Download my Singing Time Schedule HERE. 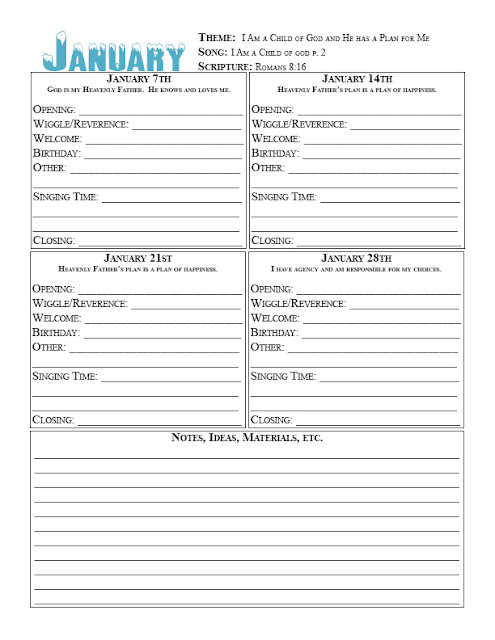 I've kept each month as it's own document so you can easily print one a time. There's also a blank one that would work with any month and any year. Also, Megan posted on the Chorister's FB group an editable one in Word. You can find her post HERE with the link to download (or I've added it HERE for those who aren't on FB). If you see any mistakes, PLEASE let me know ASAP!! I'm prone to mistakes more than I care to admit and it can be terribly embarrassing!! Now you can plan a month or an entire year if you like! If you follow me throughout the year, I'll help you get it all filled out with my monthly Singing Time Scheules that I post the last week of every month. Watch for January's schedule to be posted next week! Also, if you struggle staying organized in this calling, you can scroll through all of my Staying Organized posts all found HERE (I'd recommend reading them from the last post to the first post). 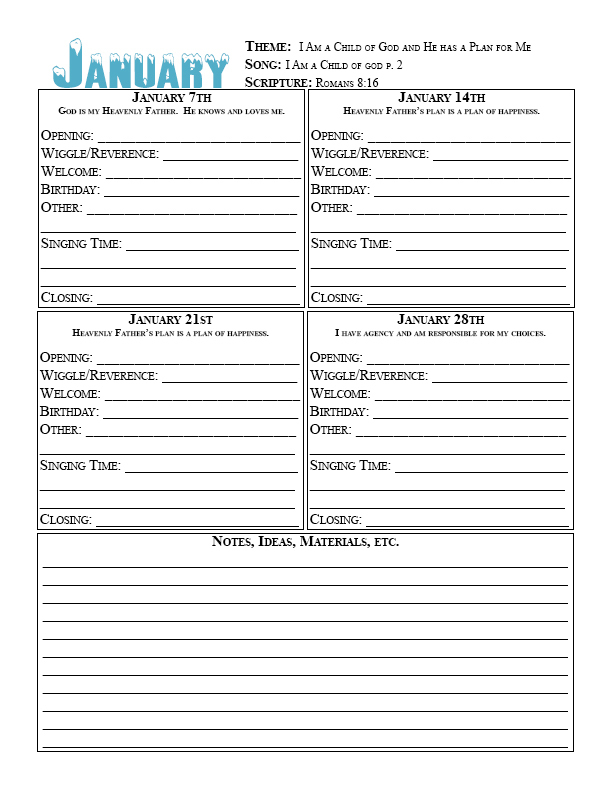 How do you like to plan your singing time and keep yourself organized in this busy calling? Leave comments to help others out! Thank you for sharing - these are brilliant!! Camille, which song are you going to use handbells with in 2018 program? And HOW are you going to teach all eight verses of Book of Mormon stories?? I love the idea. And I love you! I'll definitely be using the handbells for Easter and Chrstimas. Then my lesson plan for "I am a Child of God" will include the handbells on the descant portion of that song (check out my posted lesson plan for details). I'll be pulling out the bells more throughout the year in singing time I'm sure but I don't have any firm plans as of now. As for teaching Book of Mormon Stories, I haven't even thought that far ahead and won't have anything until that month - sorry about that! If you are looking for ideas now, you can search the FB group, Pinterest or Sugardoodle. Here are a couple of teaching ideas for Book of Mormon Stories I found online. Hope they help. http://sugardoodle.net/index.php?option=com_content&view=article&id=1107&Itemid=406 This one has 10 different suggestions. Thank you for these templates!! These are wonderful. I appreciate that you share them freely. Happy New Year! You are my go-to blog for primary singing time ideas. Thank you for all your effort and hard work. It's helping so many of us! Your ideas are always appropriate and fun for the kids and adults. Thank you SO very much!!! This is incredibly helpful! I appreciate all your TIME and efforts that you put into this great resource! Thank you so much! Always a lifesaver for a calling that stretches me! Maybe a typo, but I love your word "struggly"...because it really is how I feel. As in, am I doing this right??? Is this okay? I am filling in for singing time right now, but I anticipate the call. We'll see. Either way, I just found your blog a few weeks ago and it has been a life saver! Thank you! It's very apparent that I am "struggly" or that I "struggly" too (not sure in what context to use my new word!). Thanks for helping me fix my typo! Thank you for all that you prepare and share. You have so many ideas that are on-point. Spiritual, fun, sound musically. I appreciate your generosity. This is a wonderful template! I was wondering how I could get access to the editable ones as my primary has some specific needs. Thank you!! I've linked an editable planner in the post - I didn't create it so it's a little different than mine but it should work for you. I hope that helps.